It’s compact, practical and peppy, but the 2012 Mercedes-Benz GLK350 might not carry quite the cargo space or the rear-seat room that many families want. That said, however, this 5-door, 5-passenger SUV offers traditional German engineered performance and ride comfort in a compact frame and for a pretty conservative price. Just be aware that this little ute packs only 54.7 cubic feet of cargo area, and those rear seats are comfortable only for 3 small children. In any case, this luxuriously appointed sport ute boasts standard 19-inch alloy wheels, a rear spoiler, a roof rack and heated power-adjustable mirrors outside, with premium leatherette upholstery, wood and alloy cabin trim, a leather-wrapped steering wheel and power-adjustable front seats inside. Then there are such top-shelf touches as full power accessories, cruise control, telescoping tilt-wheel steering, a cooled storage bin for beverages, dual-zone climate control with Sun Sensor auto-adjustment and floor mats front and rear. Electronic goodies, meantime, include M-B’s touted COMMAND electronics interface, Bluetooth hands-free calling and a 100-watt audio system boasting a 6-CD changer, 6 speakers, an auxiliary MP3 input, a USB connection and steering-wheel-mounted controls. Options, meanwhile, include such noteworthy standalone items as a power sunroof, satellite radio, a Class II trailer hitch and front under-seat storage bins. Available Packages include the Premium 1 Package that adds a power liftgate, universal remote garage door opener, power-adjustable steering wheel, auto-dimming rear-view mirrors and rear parking sensors. The Multimedia Package, meanwhile, throws a navigation suite, DVD-capable touchscreen, 40GB of music storage, a rear-view camera and real-time traffic alerts into the mix. Finally, the available Full Leather Seating Package and the AMG Package again add leather upholstery, heated front seats and premium interior lighting, and 20-inch upgraded alloy wheels and an aluminum roof rack, respectively. Standard power for Mercedes’ compact GLK350 remains a variable-valve-timed (VVT) 3.5-liter V6 that mates with the standard 7-speed shiftable automatic transmission for 268 hp and 258 lb-ft of torque. Look for 3,500 pounds of towing capacity from this little SUV with the optional trailer hitch, while the standard rear-wheel drivetrain (RWD) is good for 16 mpg city/22 highway. Of course, noteworthy standard safety equipment aboard the 2012 GLK350 remains 4-wheel antilock brakes, traction and stability control, front side-mounted airbags, driver knee airbags, front-seat pelvic airbags, front and rear head airbags and front headrest whiplash protection. Further standard safety features include front fog/driving lights, daytime running lights, turn-signal-integrated mirrors and a remote antitheft alarm, with front and rear parking sensors (in the Premium 1 Package) and M-B’s touted mbrace safety alerts each optional. 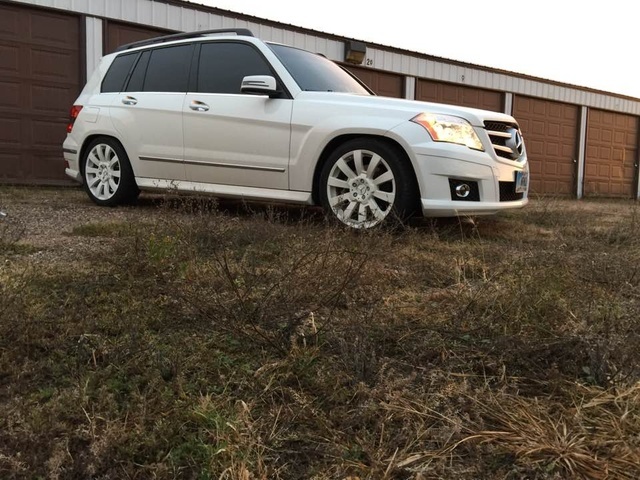 Boasting intelligent all-wheel drive (AWD), the well-heeled 2012 Mercedes-Benz GLK350 4Matic compact SUV is ready to take on winter with style and comfort. This 5-door, 5-passenger luxury-oriented ute may not flaunt the most spacious cargo area at only 54.7 cubic feet, and the three-place rear seat in reality fits three small children, but standard appearance amenities, creature comforts and convenience goodies abound. Outside, look for 19-inch alloy wheels, a roof rack, rear spoiler and heated power-adjustable mirrors, while a leather-wrapped steering wheel, wood and alloy cabin accents, premium leatherette upholstery and power-adjustable front seats adorn the inside. Of course, full power accessories, dual-zone climate control, Sun Sensor technology and a cooled beverage compartment also come standard, as do cruise control and telescoping tilt-wheel steering. Meanwhile, standard techno-goodies include M-B's COMMAND electronics interface, Bluetooth hands-free calling and a 100-watt audio system boasting a 6-CD changer, 6 speakers, auxiliary MP3 input, a USB port and steering-wheel-mounted controls. Options packages, meanwhile, include the Premium 1 Package with power liftgate, universal remote garage door opener, power sunroof, power-adjustable steering wheel, auto-dimming rear-view mirrors and satellite radio, and the Multi Media Package, with voice-activated navigation, DVD-capable touch-screen, a rear-view camera and real-time traffic. The AMG Package and the Full Leather Seating Package, meanwhile, offer 20-inch upgraded alloy wheels and an aluminum roof rack, and leather trimmed upholstery, premium interior lighting, heated seats and added wood cabin trim, respectively. Standalone options, finally, include a Class II trailer hitch, front under-seat storage and rear-seat DVD entertainment, not to mention a number of items found in the above packages. The ubiquitous variable-valve-timed (VVT) 3.5 V6 engine remains the sole powerplant offering for the 2012 GLK350 4Matic. Mated with the standard 7-speed shiftable automatic transmission, the six-banger will put out 268 hp and 258 lb-ft of torque, good for up to 3,500 pounds of towing capacity with the available trailer hitch installed. The standard AWD system allows rear-wheel-drive (RWD) cruising in normal conditions, with automatic switching of torque from the wheels that slip to the wheels that grip—even to a single wheel—when things get dicey. Mileage, meantime, remains 16 mpg city/21 highway. Notable standard safety features in Mercedes’ downsized AWD ute, finally, include 4-wheel antilock brakes (ABS), traction and stability control, front side-mounted airbags, front and rear head airbags, a driver’s side knee airbag, front pelvic airbags and front head restraint whiplash protection. Daytime running lights and front fog/driving lights remain standard, as do turn-signal-integrated mirrors and a remote antitheft alarm, while front and rear parking sensors are optional (with the Premium 1 Package), as is Benz’s touted mbrace safety alert system.